When snowstorms hit, you have to be careful of icy roads. There are a few things that can happen with icy roads. For one, your wheels can lock up and cause you to slide across lanes of traffic. Even with the toughest brakes and snow tires, you may still fishtail during snowy conditions. The best way to correct this is to your wheels into the slide. This will cause your wheels to correct the path and turn straight, but you have to do this in a gentle, calm way. When people panic, they tend to over-correct or even accelerate when they mean to brake. You also don't want to brake too hard because it may cause your wheels to lock as well. 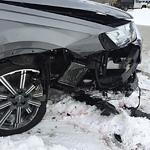 For those who have snow tires and weather alerts, you are more prepared to handle icy roads, but hydroplaning can happen to anyone in bad conditions. When you want to test drive vehicles with snow tires and all-wheel drive, schedule an appointment with Bowman Auto Center.